Steamboat is a monthly reading series of humor writers and comedians at Greenlight Bookstore, in Brooklyn. I am absolutely crazy about Steamboat. Sometimes– I shouldn’t say this, since I am a writer and an editor, but– sometimes, readings can get boring. Sometimes there are like six authors lined up reading terribly literary works, and I become aware of how I have basically no attention span and can’t sit still for longer than four minutes at a time. Should we blame TV? Should we blame refined sugar? I don’t know, but I do know that whenever a movie is longer than 90 minutes, I experience serious doubts about seeing it. But what’s amazing about the Steamboat reading series is that, in all the times I have gone, I have never found it boring. Because it’s FUNNY. And I don’t get bored of laughing. I saw Simon Rich read at Steamboat a while back, and as you know he is one of my favorite humor writers. I saw Steve Hely at Steamboat, reading from HOW I BECAME A FAMOUS NOVELIST. Pretty sure this is before that book won the Thurber Prize. I saw Gabe Liedman, who does the Big Terrific comedy show, at Steamboat, telling an insane story about almost macing Lou Reed outside of Magnolia Cupcakes. If you went to Steamboat this month, who knows what you might see? Well, here’s one thing: you’ll see me! I’m going to be reading next Thursday, February 16. The full facebook event is here: https://www.facebook.com/events/353902904620880/. There are going to be many other funny people there. Come laugh with us! Or at us. Whichever. And you probably won’t even get bored. Just think about that. 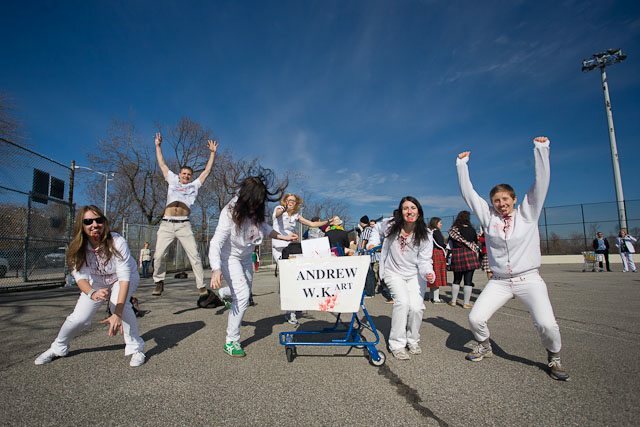 I’m sure you’ve been waiting with baited breath to find out what my team’s theme was for Saturday’s Idiotarod. Wait no longer! I’ll tell you. If it’s still not clear to you what our theme was (since it was not clear to either of my parents): We all dressed up as Andrew W.K., famed rock ‘n’ roll artist, motivational speaker, tweeter, and partyer. The Idiotarod was not great this year. For some reason the organizers decided to make the course route last 13 miles through barren warehouse-land somewhere in Queens. We wound up miles from the nearest subway as night fell, with nothing to help us but a decorated shopping cart and a boom box playing “Party Hard” for the 18th time that day. Poor planning, Idiotarod. Also, 13 miles? I’m a writer, not an athlete. Primarily, what I got from Saturday’s Idiotarod was shin splints. But fortunately I also got some great photos of me with greasy party hair and fake blood pouring down my face. You can see some of those pictures here. Party hard, friends. Party hard.